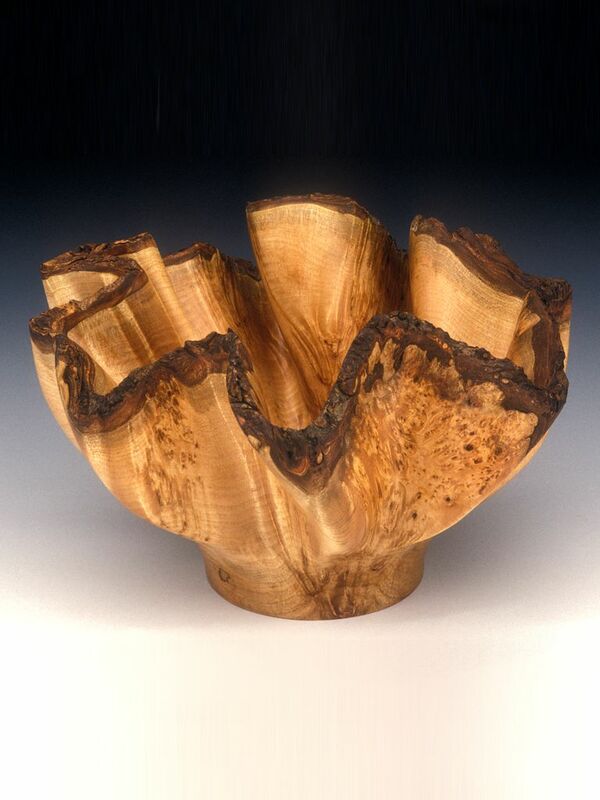 The grain movement alone suggested ocean waves to me…and inspired my attempt to transform the inside and outside of this Maple burl into an undulating wave sculpture. Those dark edges are bark that revealed the most breathtaking wood grains within the burl. It had been attached to a felled Maple tree that measured 2’ in diameter and 16’ long. Nature is stunning and truly the most inventive of Partners. The creative process for Oceania, called turned and sculpted, not surprisingly is multi-stepped. I began by turning the rough exterior contour on a lathe and then drilling a 1 ¼” diameter hole into the top center. The final form was achieved by sculpting both the inside and the outside faces to produce the undulations. The same piece of waste wood gave me material for a turned and sculpted vessel I created and named Black Hills, after the famous and mysterious Black Hills and Badlands of South Dakota.